Here is a compact I find myself reaching for more and more lately. These are great colors and you can do a ton of different looks. I usually use the 2 lightest colors on my lid and use the darkest purple as a liner. I have yet to use the blue, but one of these days I'll venture out of my comfort zone. 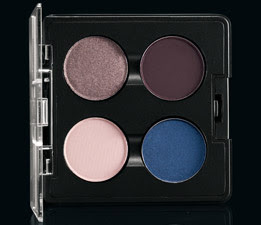 This compact goes with the Cult of Cherry collection from MAC. It features limited-edition shades of Light Fall, Smudged Violet, Deep Truth and Shadowy Lady in a lush textural mix of satin, lustre and matte finishes. The last all day and hardly crease. Although I do use a cream shadow as a base which helps to anchor anything I put on top of it. You can find this compact at maccosmetics.com for $36.